LONDON, England (CNN) -- Some of the heaviest hitters in the world of motorsports were coming together Friday in London a bid to steer Formula One out of what is fast becoming a crisis. 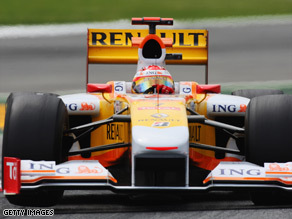 Renault are among teams who say they they will not race in 2010 unless proposed changes are dropped. Max Mosley, president of the FIA, the International Automobile Federation, will be confronted at the meeting by the heads of Ferrari, Red Bull, Renault, Torro Rosso and Toyota. The teams have threatened to pull out of the sport if the FIA introduces sweeping budget cuts as planned next year. At the moment, the big teams, such as Ferrari and McClaren, operate on annual budgets of $200 million to $300 million. The FIA wants all teams across the board to function on about $60 million a year. Teams might decide to not stick with the budget cap, but those that do will get technical freedom. Opponents say that will make the sport a two-tier competition. All the teams and the FIA have agreed that cuts need to be made amid the current global financial crisis and they have taken measures to reduce costs for this season. But the dramatic cuts for next season have the big spenders up in arms, with Ferrari leading the charge this week by threatening to end its 60-year relationship with Formula One. Though the sport could barely do without a team such as Ferrari -- research shows that one-third of all fans who turn up at races go to watch the Ferrari team -- Mosley remains resolute in pushing forward with the cuts. He has been buoyed by recent news that Aston Martin, the English car maker, would enter Formula One if the new cost cuts were introduced. Two more teams are set to enter the competition next year, which means the grid would be full but perhaps not complete. Friday's meeting in London is aimed at thrashing out an agreement to put to rest, for the moment, the infighting that has blighted Formula One in recent times. This latest battle off the track comes a year after the McLaren team was fined $100 million for spying on Ferrari. This year, defending champion Lewis Hamilton was found guilty of lying to race stewards.